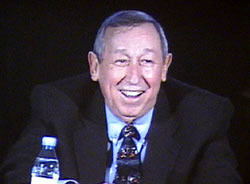 Animated News contributor James R Whitson recently returned from Philadelphia where he attended Roy Disney and Stanley Gold’s SaveDisney.com meeting as well as The Walt Disney Company’s annual shareholder meeting. 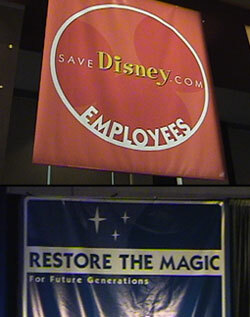 What follows is an account of both meetings, as well as photos from the SaveDisney.com meeting (Disney did not allow cameras in the shareholder meeting). Since most major news items have already been reported by this site, this account is mainly a look at how the meetings were conducted along with some of the lesser reported, but still interesting, items. 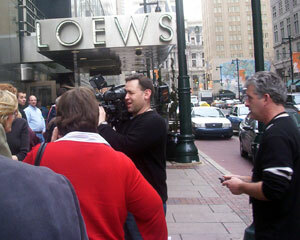 With an almost overwhelming media presence, about 1500 people lined up to attend the meeting which took place in a room that would only support 1000 of them. The meeting began with a video of people from all walks of life reading letters of support received by the SaveDisney team over the past few months. 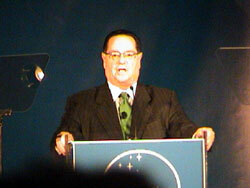 As the video ended, Stanley Gold took to the podium. 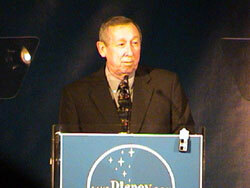 He began by introducing Roy Disney’s wife and children, former board member Andrea Van de Kamp, and his own wife. He went on to speak about the company as it was during Walt’s time. This was followed by a humorous slideshow of old Disneyland pictures collected by Charles Phoenix (http://www.godblessamericana.com). Gold returned to the stage and began discussing the problems with the Disney board, mostly already outlined on the SaveDisney site. He warned those present that if a substantial number of shareholders gave Eisner a vote of no confidence that the board might try a PR stunt such as separating the jobs of CEO and Chairman. Gold agreed this was necessary, but added that “Eisner need to have neither job”. Michael McConnell, Shamrock Holdings’ Managing Director, presented a slideshow that went into the in-depth problems they see in the board (slideshow similar to this one from on their website ). A commercial featuring Roy Disney was shown (lo-res | hi-res) and at its end, Roy himself headed to the podium to thunderous applause. He introduced his family again, and began to speak of his vision for the future of the company that bears his family’s name. Two quotes exemplify the themes of his speech: “we need to do this because it is the right thing to do” and “this is only a step in the process, until we make the changes that need to be made”. A Q&A session followed. The most interesting item to emerge from this was a quote from Roy where he said “Pixar wants to work with Disney. If Eisner and the current Disney management were to be changed, we could make a deal with Pixar in two weeks”. Gold was asked if they had any names in mind as a potential replacement. He said that while they had no name, the person would have to have a strategic vision and be able to understand and interact with creative people. He added there was an “obvious shortlist of 5-10 people” who fit that criteria. The meeting broke up and Roy, Stanley, and Michael McConnell stuck around to answer questions before heading to a lavish reception held next door for all those in attendance. Humorous drawings adorned the room, where Roy and Stan signed autographs and took pictures with fans. As the 3000 shareholders who would be lucky enough to find seats entered the meeting room, classic Disney songs were piped over the sound system. Interestingly, no songs from after 1994 were played and some songs seemed oddly appropriate – “Following the Leader” from Peter Pan, “A Spoonful of Sugar” from Mary Poppins, and “Who’s Afraid of the Big Bad Wolf” from The Three Little Pigs. 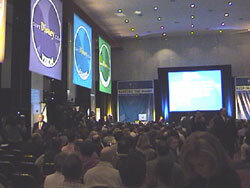 The meeting began with a flashy video of current and upcoming Disney projects. A surprisingly upbeat, but very hoarse, Michael Eisner took the stage to relatively mild applause. 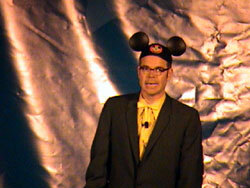 He gave a short speech on the future of the company whose main theme was exemplified by his statement that Disney would “take creative risks while mitigating financial risks”. He then turned things over to Board member George Mitchell who spoke on corporate governance. Two retiring board members then took the stage to give their good-byes before the meat of the meeting started. The business meeting portion began. Five items were on the agenda with the first being the one most people were waiting for. 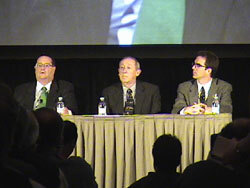 By previous arrangement, Stanley Gold and Roy Disney were allowed to speak and were greeted with enthusiastic applause. They repeated the themes they had made at their meeting the previous day, but Gold made the startling announcement that he expected 40% of the vote to go against Eisner. Roy Disney, apparently in a preemptive strike against one of the company’s major talking points of the day, warned against the “branding of Disney”. He said branding is necessary for products like shoes and laundry detergent, because “branding is something you do when there is nothing original about your product”. Eisner, for the most part, took their pronouncements in stride. He said that “unwillingness to listen was not the issue” when Gold and Disney were board members, rather “unwillingness to agree was the problem”. The four other items on the agenda were fairly mundane compared to the first, and a Q&A section followed each. The only notable thing that occurred during the Q&A was that renowned shareholder activist Evelyn Davis rose at every opportunity to ask questions interrupting Eisner and even other shareholders at times. She originally had the audience laughing and cheering her on but after too many interruptions (one of which was to tell Disney’s treasurer to call her Ms. Davis – “I’ve been married three times!”) she drew their, and Eisner’s, ire and was asked to remain seated or be removed. After the business portion of the meeting ended, the heads of various departments gave presentations on what shareholders could look forward to in the future. Mr. Incredible’s secret identity: Bob Parr? ToonDisney will finally reach profitability this year. She also reported that according to a survey of people attending Finding Nemo in theatres: when asked where they heard about the movie, promotion on the Disney Channel was the #2 response. She noted that “this is the kind of exposure Pixar literally cannot buy”. Eisner ended the meeting by saying that the “allegations and conclusions [of his opposition] are not correct nor in the best interest of the company”. 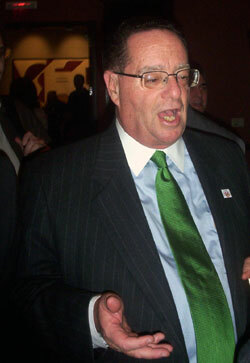 Preliminary results of the Board elections were announced, showing Stanley Gold’s surprising pronouncement was correct – about 41% of the counted ballots withheld their votes from Eisner. Every other director lost at least 20% of the vote. Special thanks to Chuck Mauceri for allowing an Animated News contributor to attend the shareholder meeting with him as a guest.